In about two days, thousands of you will lose the attention of your spouses and loved ones (and I'll lose a significant number of readers), because it is - of course - once again time for National Novel Writing Month, also known as NaNoWriMo. I, myself, don't participate. But I have far too many friends who do (including my wife). And, over the years, I've accumulated a number of games which can help sharpen that storytelling edge. Dixit (and/or any of its expansions): If you're not going to be actually playing it as a game, then don't worry about whether an expansion is standalone or not. If you're writing any sort of fantasy, then use the images as inspiration. Use them for character backgrounds or plot points or however you want. Rory's Story Cubes: There are three sets available in North America. If you're in Europe, there are three (smaller) sets available as well. If you get stuck for an idea, roll the dice and see if they help. The base set is mostly things, the expansions include one set of actions and one set of voyages. Each of these sets is nine dice with images instead of numbers. Roll and then pick-and-choose. The three European-only (so far) sets are Clues, Enchanted, and Prehistoria. Each of these sets contains only three dice. Short Order Heroes: Having trouble coming up with personalities for those minor supporting characters who pop up occasionally? Maybe it's a "one-time" character that you'll never see again. Flip a couple of cards from this game up, and you have those character traits covered. Texas Zombies: This is a deck of things. It was designed as a storytelling game where you used the things in the deck to overcome obstacles within the deck. You can play it to sharpen your storytelling edge, or you can use the cards to see what sort of inspiration appears. Story War: This is in a similar vein to Texas Zombies, but has different kinds of cards - the base set includes 50 Warriors, 25 Items, and 25 Battlefields. You can - again - play the game to sharpen your storytelling edge or you can mine the decks for ideas. 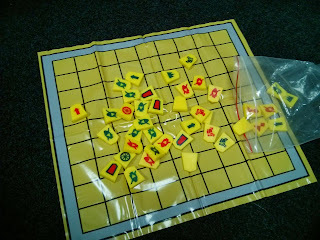 Remember a few weeks back, when I wrote about The Duke, and talked how my enjoyment of the game at GenCon sprang (in part) from my fond memories of Shogi? While in the garage last week, I found my copy of Shogi For Beginners, which is fortunate, given the current prices for the book. And I realized that I want to play more of the game. So I went to Amazon and ordered a cheap set. This set, to be more precise. I chose that one because of its nonstandard markings. Unfortunately, the set was terrible, and so I returned it. 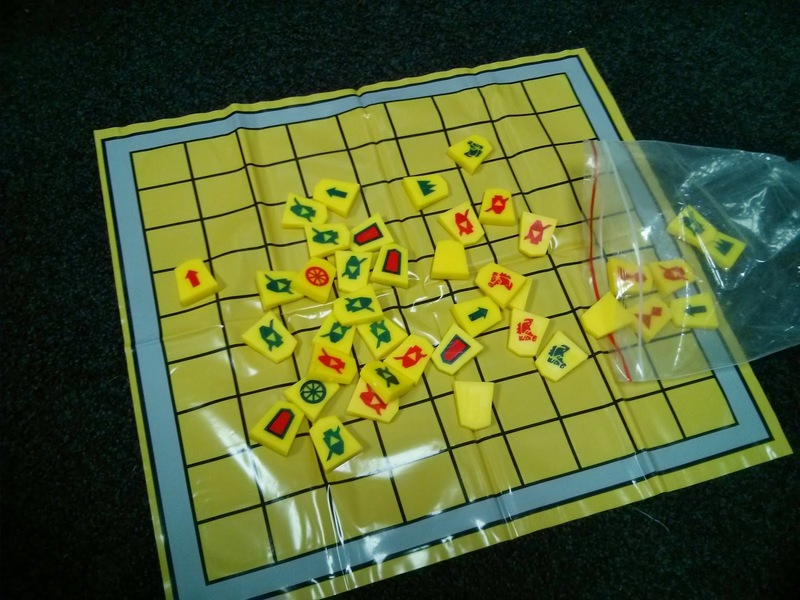 It was low-quality yellow plastic with an extremely cheap yellow vinyl mat for a board. So, instead, I've ordered this set, which was recommended to me by a friend. It also uses nonstandard markings, and the way each piece moves is printed on the piece itself using a very clear (and concise) notation which reminds me a bit of the Navia Dratp notation. The promotion zones are colorful and clear. And I trust my friend's input. So why do I crave more Shogi instead of the more common (and more conventional) Chess? Let's start with "I'm not good at either of them." I'm a decent Chess player. Not exceptional. Not tournament-level. I understand the concept of the game, I know how the pieces move, and I am good at seeing my own doom coming. I'm even pretty good at frustrating my opponents. I'm just not good at getting the win. So what's different enough about Shogi that I want to play more? Most of the people I know are on a near-equal footing with me. The game is similar enough to Chess that it's familiar, but it's different enough that strong players of one aren't going to necessarily be strong players of the other. Captured pieces are captured and not eliminated. When talking about Chess, we refer to pieces as having been captured. In reality, they have been destroyed. Eliminated. They are no longer at all relevant to the game. In Shogi, any piece I capture, I can put back on the board under my control. It means that sacrifice plays suddenly require a bit more thought. Because that Lance that I sacrificed a few moves ago could be used against me at any point. Multiple pieces in Shogi can promote. In Chess, only the Pawn can promote, and only if it reaches the eighth rank. In Shogi, pretty much any piece except for the Gold General is able to promote. Each piece also has a specific promotion, too, so it's not like I can have a force of all Queens. Most of them promote to Gold General, but not all of them. And promotion doesn't require reaching the ninth rank - you only need to reach the seventh. There is only one Rook and only one Bishop in Shogi. Knights only move forward (not sideways or back). Pawns don't attack diagonally. There's nothing that moves like a Queen - instead, there are two types of Generals who move differently. And there's a piece that moves like a pawn only with no "one space per turn" limitation. It all leads to a game that has a great deal in common with Chess, but has enough significant differences that it has an entirely different feel. The different knight, for example, cripples my usual Chess strategy. And sometimes that's all you really need, right? Twenty years ago, I was a Japanophile. I ate a ton of teriyaki (with chopsticks), I watched a lot of anime, and I read a ton of manga. At the time, I was much more a role-player than a boardgamer, but I still had a fascination with good board games. In Seattle, there is a store called Uwajimaya. It's a Japanese grocery with a couple of local branches. The one in Seattle also includes a Kinokuniya Bookstore, and during one visit, I wandered out of the manga section and found a magnetic travel copy of Shogi. It was hidden in and amongst several much more expensive sets, but I still found it. I grabbed it and a copy of Shogi for Beginners, and called it good. I puzzled over it for months, but didn't manage to get a game in for a while. Not until my college fencing partner turned out to be a Shogi player, and spent some time going over the game and some of its strategies with me. I was still never any good at it, but at least I started to figure out why I was losing so badly. One of the distinctive features of the game is that the pieces are double-sided, and some pieces which reach a certain part of the board may promote themselves to a different piece which then moves differently. Then, about ten years ago, I encountered Navia Dratp. It was a collectible chess-like game, and each piece had a different movement pattern again. And, in a clearly Shogi-influenced way, most pieces had the ability to promote themselves. And, if you could promote your King (called the "Navia" in this one), you won. The game was good. I bought a ton of the base game and its boosters. Then it went idle for close to a year before the expansion came out. I never bought any of the expansion boosters. This year while at GenCon, I saw wooden pieces moving on a wooden board. The pieces were square, but the movement reminded me a great deal of Shogi - in part because they kept flipping over. I asked what the game was, and was told it was a new game from Catalyst Game Labs called The Duke. It had apparently been Kickstarted, and I had missed it. But I had to try it. So I did. And I liked it. A lot. Because it reminded me of both Shogi and Navia Dratp, two games that I very much loved. But you don't have to just take my word for it, either - Catalyst has made it available for download as a print & play game on their website. I've ordered it from my FLGS (I didn't buy as many games at GenCon this year, because I made a conscious decision to support my FLGS instead), but it hasn't arrived, yet. When it gets here, I very much hope that Stephanie enjoys it as much as I do. I watch way too much TV, sometimes. And too many movies. And I probably read too many books, too. Especially when every thought I have while reading or watching is game-related. At times, it's led to some really entertaining conversations. "Wow," I'll say to Stephanie, "That author relies too much on his NPCs." I love conversations that you see here and there where players try to generate [character] from [media] in [system]. I don't tend to participate, but I love some of the discussion that springs up. My favorite game these days is "spot the NPC." There are characters who are obvious NPCs - assuming a traditional game structure. Which you can't always do these days. See, Smallville - the TV series, that is - was good, and in a traditional game, the party would have been Clark, Lana, and so on. As the overall villain of the thing, Lex would have been the villain of the piece - and an NPC. But when Smallville the RPG came out, it was structured in a very non-traditional way and Lex was one of the sample PCs. But there are other - larger - media properties where the author(s) have wielded NPCs poorly. And here I step into the role of heretic. I think that it's hilarious every time someone writes up stats of Gandalf, because - to me - he's clearly an NPC. Think about it. Start with The Hobbit - who assembles the party and starts the adventure moving? Gandalf. Yes, the Dwarves were already known to one another, but Gandalf set the meeting point - and really, it's a party that ... um ... wasn't well-assembled. Who is conveniently off-camera and/or completely ineffective every time something important is happening? Gandalf. Now look at the trilogy: Who recognizes the Ring? Gandalf. Who tells the hobbits where to go? Gandalf. Who generally only shows up to dispense wisdom or information before disappearing again? Gandalf. Yes, he fought the Balrog and saved the party - at the same time, that could have been the GM realizing that the party was relying too heavily on Gandalf's Navigation and trying to remove him from the picture. Even though the entire Moria sequence is filled with Gandalf saying, essentially, "I think it's this way, but I'm not sure." Honestly, it sounds to me like a GM who wants the party to do some exploring on their own. Later, the party was split, and they weren't doing so well. Who got most of the party back together? Gandalf. Honestly, if Tolkien was my GM, I'd have been pretty annoyed at this meddling wizard who was really only helpful under duress most of the time. It's a common problem with NPCs. You need them to fill your game world - and it can be nice to have one in the party to help keep them on track - but you need to balance that with the need to make sure the players are having fun. Because the game is all about the players. If the party is stumped because they've encountered a puzzle that they can't solve due to a run of bad die rolls, then find a way around the puzzle. Don't have Bob the Torchbearer suddenly remember that his dad (the clockmaker) had constructed something similar. You can drop hints. Maybe Bob the Torchbearer has a similar pattern stitched onto his coinpurse, and you can allow the PCs to roll again. Maybe Bob has an idea that doesn't sound like a good one - but it puts the party on the right track. The NPC is there to keep the party on target, not to solve the party's puzzles and problems. NPCs can be part of the party's plans, but they shouldn't be the ones coming up with the plans. I'm a sandbox gamer. I like creating worlds and then setting things in motion. In my current Cthulhutech game (that I need to get back to running), for example, the PCs are all cops. Their Captain is an NPC, as are the other authority figures. In general, they are assigned a case (or cases), and are left on their own to solve them. I have a chart in my head that lists each case and what is happening in what time frame on these cases. If they focus on one issue, that won't stop the looming gang war. It won't stop the Feds from transferring the cultists that they need to question to the Puyallup Valley Correctional Facility. The Deep Ones won't stop their planning just because the party is chasing down an Occult Drug Dealer instead of following up on that unusual firearm that some kid fished out of the Sound. I recently acquired an excellent tool for building NPCs. See, most NPCs don't need full stats. They often don't need any stats at all - they just need personalities. In my Cthulhutech game, for example, the party doesn't have a Techie - they just turn to Askrob for help, and he tells them what they find out. Now, I could roll for what he finds, but if I need them to have information, then I need them to have information. Leaving the disclosure of that information up to a die roll is silly. So Askrob - despite being an important supporting character - doesn't need stats. He needs a personality. Left to my own devices, most of my NPCs would be almost the same - Sarcastic and argumentative or timid and jumpy. In fact, too many of my NPCs are ... flat. I'm willing to admit that. It's one of my (too many) weaknesses as a GM. A few months back, I backed a project on Kickstarter called Short Order Heroes. I've since received my copy, and it's now available for pre-order. It's a deck of personality traits. Need a quick NPC? Pull a trait or two (or three). Boom! Instant NPC. You can even tell your players which personality traits your NPC has, so they know how to react to him (or her).